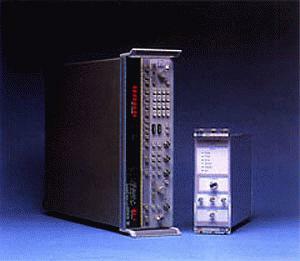 The Phase Matrix/EIP 114XA family of VXIbus synthesized signal generators are ideal synthesizers for ATE applications. In only 3 VXI slots, They combine 0.01 to 20 GHz performance with 1 Hz resolution, unique complex modulation capability and outstanding spectral purity. Three models cover 4 to 12.4 GHz , 2 to 20 GHz or 0.01 to 20 GHz . All are fully compliant with VXIbus specification Revision 1.3/1.4 and Standard Commands for Programmable Instruments (SCPI) version 1993. Microwave performance is not compromised for VXIbus compliance. The 114XA series utilizes full modular shielding and post regulation with double filtering to ensure outstanding performance, even when sharing a system with digital instruments. And the 114XA does not sacrifice spurious and phase noise performance for small size. With spurious signals below -60dBc/Hz at 10 KHz offset, the 114XA is ideal for local oscillator duty in radar/EW testing, narrowband device characterization, and communication systems testing.